Supreme Court Justice Clarence Thomas took a swipe at Sen. Cory Booker (D-NJ) over his ‘Spartacus’ moment during judge Brett Kavanaugh’s confirmation hearing last week. 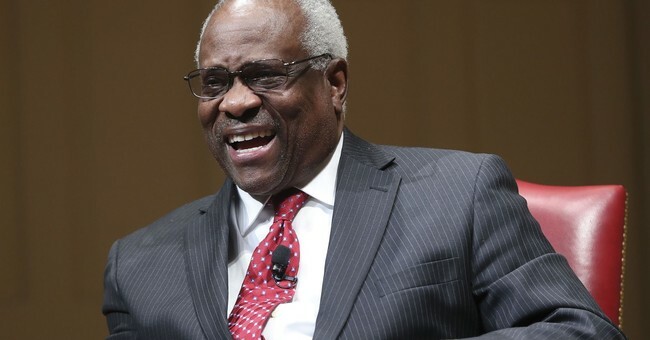 "Honorable -- if we could use that word about more people who are in public life, people who actually ask the questions at confirmation hearings, instead of 'Spartacus,'" Thomas said during a conversation with The Federalist Society’s Leonard Leo last week, prompting laughter from the audience and the justice himself. Booker claimed to be Spartacus when he released committee confidential documents that actually showed Kavanaugh was against racial profiling, among other topics that did not appear to be controversial or damaging. Those documents had already been cleared for release to the public that morning, however. "This is about the closest I'll probably ever have in my life to an 'I am Spartacus' moment,” Booker said. Thomas pressed on about the need for integrity in public life. "If we could use the word honorable more often, think about the difference it'll make," he said. "Then, you'll have a legacy. We will have left the country in better shape, morally, structurally than we found it." "But as long as we're looking at our interests, or scoring points, or looking cute, or being on TV," Thomas said, "especially the legal system, how do we maintain it? If you can't debate hard issues honestly, with honor, with integrity, how do we keep a civil society?" Thomas wasn't the only one to take a jab at Booker over his grandstanding. Sen. Marco Rubio (R-FL) mocked his colleague for the performance as well. “On this day in 71B.C. the Thracian gladiator Spartacus was put to death by Marcus Licinius Crassus for disclosing confidential scrolls. When informed days later that in fact the Roman Senate had already publicly released the scrolls, Crassus replied “Oh, ok, my bad”.